Denver, Colorado & New York (March 15, 2018) – Fans of “The Walking Dead” universe can now experience their favorite post-apocalyptic world on the big screen as Fathom Events and AMC announced today “Survival Sunday: The Walking Dead & Fear the Walking Dead,” a one-night fan event on April 15. Celebrating the highly-anticipated series crossover, “The Walking Dead” Season 8 finale and the “Fear the Walking Dead” Season 4 premiere will be screened commercial-free in more than 750 select movie theaters nationwide. The cinema event will also feature exclusive bonus content to be announced in the coming weeks. 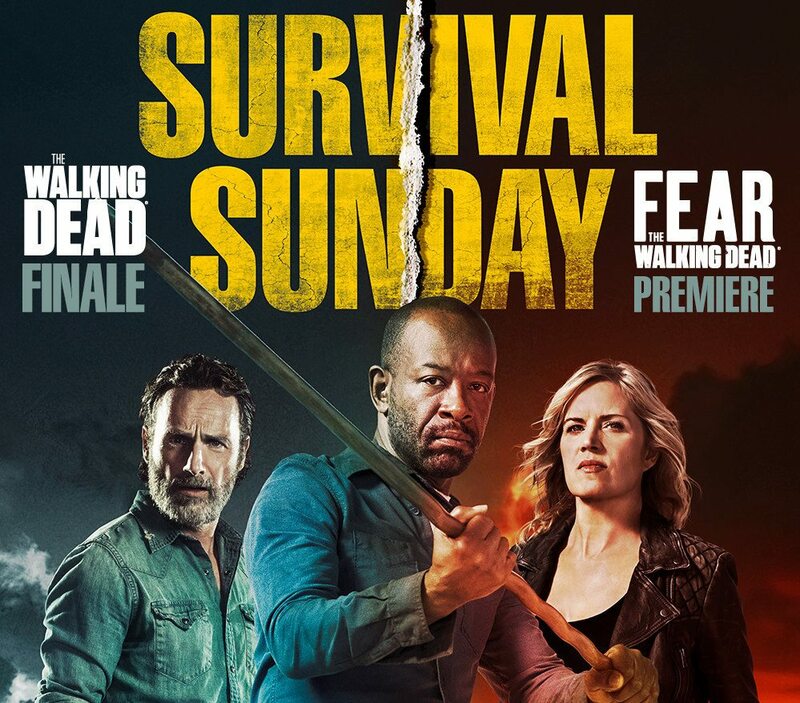 Tickets for “Survival Sunday: The Walking Dead & Fear the Walking Dead” can be purchased beginning Friday, March 16 at www.FathomEvents.com or participating theater box offices. Members of TWD Fan Rewards Club can purchase their tickets starting Thursday, March 15 at www.TWDRewards.com and earn points for their fandom. For artwork/photos related to “Survival Sunday: The Walking Dead & Fear the Walking Dead,” visit the Fathom Events press site. Fathom Events is the leading event cinema distributor with participating theaters in all 100 of the top Designated Market Areas, and ranks as one of the largest overall distributors of content to movie theaters. Owned by AMC Entertainment Inc. (NYSE: AMC), Cinemark Holdings, Inc. (NYSE: CNK) and Regal Entertainment Group (NYSE: RGC) (known collectively as AC JV, LLC), Fathom Events offers a variety of one-of-a-kind entertainment events in theaters such as live performances of the Metropolitan Opera, top stage productions including Newsies! The Broadway Musical and George Takei’s Allegiance, major sporting events such as Mayweather vs. McGregor, epic concerts with artists like Lady Antebellum and Sammy Hagar, the yearlong TCM Big Screen Classics series, inspirational events such as Is Genesis History? and IN OUR HANDS: The Battle for Jerusalem, and beloved anime titles like Princess Mononoke and Spirited Away. Fathom Events takes audiences behind the scenes for unique extras including audience Q&As, backstage footage and interviews with cast and crew, creating the ultimate VIP experience. Fathom Events’ live digital broadcast network (“DBN”) is the largest cinema broadcast network in North America, bringing live and pre-recorded events to 912 locations and 1,427 screens in 181 DMAs. For more information, visit www.fathomevents.com. AMC is home to some of the most popular and acclaimed programs on television. AMC was the first basic cable network to ever win the Emmy Award for Outstanding Drama Series with “Mad Men” in 2008, which then went on to win the coveted award four years in a row, before “Breaking Bad” won it in 2013 and 2014. The network’s series “The Walking Dead” is the highest-rated series in cable history and the number one show on television among adults 18-49 for the last five years. AMC’s other current original drama series include “Better Call Saul,” “Fear the Walking Dead,” “Into the Badlands,” “Humans,” “Preacher,” “The Son” and the forthcoming “Dietland,” “The Terror,” “Lodge 49,” and “McMafia.” AMC also explores authentic worlds and discussion with original shows like “Talking Dead,” “Talking With Chris Hardwick,” “Comic Book Men” and “Ride with Norman Reedus.” AMC is owned and operated by AMC Networks Inc. and its sister networks include IFC, SundanceTV, BBC America and WE tv. AMC is available across all platforms, including on-air, online, on demand and mobile.